Year 4 had a thoroughly enjoyable visit to Ipswich museum last Thursday, to take part in workshops about the Stone Age. The children followed clues to lead them to Mesolithic finds; handled original artefacts, planned a Neolithic settlement in the right location, and made replica Stone Age clay pots. Thank you to the parents who accompanied us. The Year 3 children went to the museum the following week.... here's a link to an article and some photos of their day which were published on the EADT- online. The Year 6 pupils are delighted with the new dining furniture in their covered courtyard! Unsurprisingly, no matter what the weather is like, the oldest children in the school enjoy the perk of having an exclusive dining space. The old wooden picnic benches have been replaced with these brighter, more practical, tables and benches. Our thanks go to the Diocese of St Edmundsbury & Ipswich for funding these. 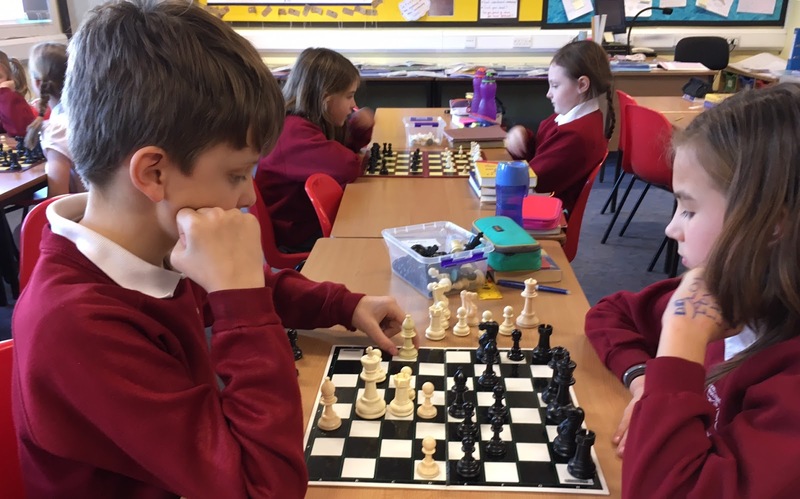 Thirty-nine of our year 5 and 6 pupils entered this year's chess tournament and the first round matches have started... Good luck to everyone! Ahoy there, me hearties!! I've marooned my crew on a desert island!! Well - they weren't following rules so they've had to work hard to find food! They were feeling hungry and so have decided to examine a variety of fruit to work out which ones they would put on a kebab. Firstly, Class LH looked at the journey the fruit travelled on and why the historic pirates would have chosen local foods from around the world to eat. The children learnt how to hold the fruit using the 'claw' and the 'arch' method for cutting safely. Once the fruit was cut up:- the stones were removed from the plums; the kiwi, the orange, the melon and the pineapple had their skins removed; the apple and the pears had their cores removed; the banana was peeled and chopped and the grapes were cut into quarters. The children then all tried the different fruits and decided which ones they wanted to put on their kebabs. There was a great list of adjectives used to describe the fruits such as tangy, tasty, juicy, squidgy, bitter, sweet, sour, fleshy and crunchy. After that, the pirates made their fruit kebabs and evaluated them using detailed and well-thought out ideas. They really thought carefuly about how they would improve them next time and this was a valuable lesson for them all. Luckily, the pirates were all able to find some fruits for their kebabs so on this occasion none of the marooned pirates starved!!! Each School Council Rep went back to their class with a big smile on their faces and an arm full of 'wet playtime' games. The games, colouring books and packs of cards were paid for by the Friends and will help make wet lunchtimes and playtimes more fun. On Thursday afternoon the Girls Football Team travelled to Saxmundham Primary School to participate in a special 'play-off' fixture to determine who would progress onto the prestigious County Finals event in Bury St Edmunds in just over a week's time. The match itself was everything a spectator could wish for from a local sports derby - competitive, fair, high quality and heart-pounding. Framlingham ran out eventual 3-2 winners after completing a magic moment of build-up play during 'golden-goal' extra-time. 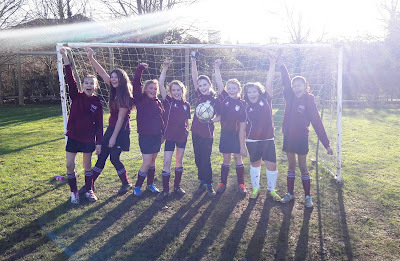 Both teams should be extremely proud of their achievements both on and off the field during the fixture. I would like to thank all players for their efforts and teamwork abilities and wish them the best of luck at the County Finals stage next Saturday. Thanks also to Mrs Seeley, Mrs Nathan and Mr Shakeshaft for supporting the team so well at this event. As part of our Mighty Metals topic we made jewellery. We had to design a piece of recycled bottle lid jewellery. Thinking carefully about how many bottle lids we would need and the colour and pattern we would use. We coloured the inside of our bottle lids and then an adult safely put a hole in the middle of the lid. We then created our jewellery this was very tricky. Some of us made bracelets, necklaces and hair braids. Thank you to all the public houses in Framingham who kindly collected the bottle tops for us. Good day me hearties! Captain Greybeard left a message for class LH this morning that he had hidden a box of treasure and jewels for us to find. He’s asked us to look after it whilst he searches for his parrot – which if you happen to see it has a long, black, curled beak! Captain Greybeard left the cryptic poem with clues about where the treasure would be hidden. Once we found it hidden under the Jolly Roger flag, there was a letter written on parchment to ask us to look after it. He told us about how he had been marooned and that some of our ‘messages in bottles’ had helped him. We then took the treasure box back to class where we opened it to find out what the loot was that he had left. There were some gold doubloons and some fancy jewels in earrings and rings! Yoga Jo has been coming to our school for a number of years now and the children really enjoy their Yoga sessions with her - this half term the Year 5's get a turn.. today after their initial warm up and stretches they were learning the 'Warrior' and a few other paired positions. 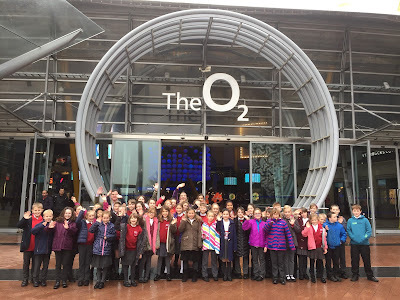 Well done the team who sang at The O2 Arena – You were amazing! Here are a few videos giving an impression of what it was like form the audience’s point of view and then ours from the top of the arena. Thank you to Mrs Waddell for creating such a fabulous banner and also a big thank you to all of you for brilliant dancing, singing and impeccable behaviour! On Tuesday, Classes LC and RH had a visit from Matt Flack who is a sound engineer. More recently he was in Peru and before that the jungle in Liberia. He showed us pictures of some of his experiences and how he camped in the jungle. He also had other sound engineers send us pictures of them doing their jobs in different places. We tested out his mic and headphones. We were so inspired by his visit that we became production crew filming in the jungle. We then wrote adventure stories. Thank you Matt for coming to speak to us. The production crew travelling down the river..
Life has been busy in Foundation this week. Here are some photos of a few things we have been doing. … and it snowed! Hooray – the first snow some of us have ever seen. 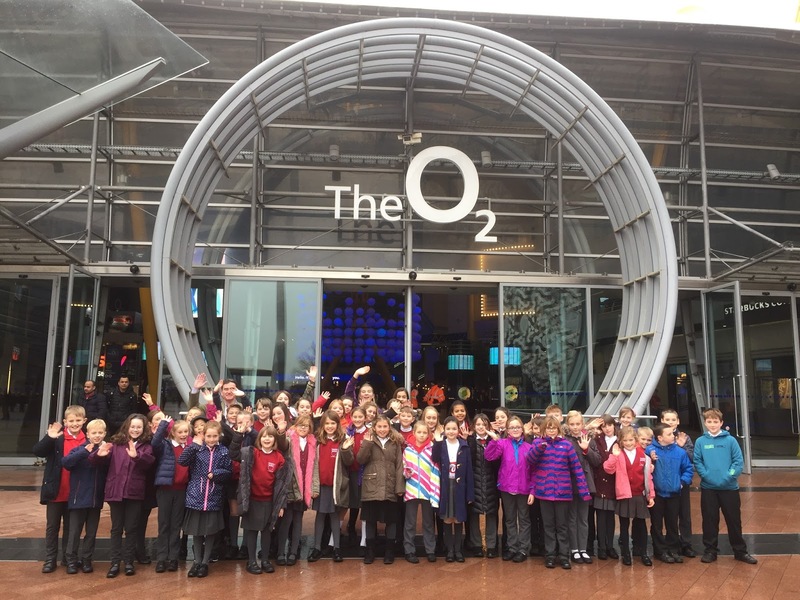 We have 45 of our year 4, 5 & 6 children off to London on Monday to perform in the Young Voices Concert at the 02. Mrs Mawson has been working the children really hard, with rehearsals all this week. Good luck everyone - we know you'll shine! In Science club, year 5 made a pH indicator out of red cabbage. The cabbage was chopped up and soaked, allowing the pigment ‘anthocyanin’ to come out. We then tested various substances to see where they were acidic, alkaline or neutral. Children in year 5 have started their new ‘Stargazers’ topic. Today, children learnt about the different phases of the moon. We talked about how the amount of the Moon you could see from Earth was dependent on how much of it is illuminated by the sun. To prove this, Miss. Whipps set up an experiment which involved the children pretending they were the Earth on a swivel chair. We shone a torch and held a melon in the position of the moon whilst swivelling carefully on the chair. The children had lots of fun and could clearly see what was happening from this simple experiment. Class VW had an exciting maths challenge to take part in. To help with their work on decimals and estimation, the children were required to spend a pretend budget. Miss. Whipps made it more interesting by putting the following restrictions in place: they could only purchase one of each item, no single item could exceed £25 and they had to have a least 15 items on their list. Miss. Whipps was very impressed with the methodical attitudes the children displayed towards their work. LH welcomed many parents and grandparents to join our maths share session which was based around our topic this month “Land Ahoy!” The children taught their parents how to use the QR codes on the tablets to work out some mathematical calculations and many parents enjoyed the challenge of the strategy games! There was also measuring, constructing, problem solving and 'Treasure Hunt' games. "Such engaging activities for the children and parents"
"Warm and friendly classroom atmosphere"
"He was very excited showing me around his class and the wall art. Thumbs up!!"